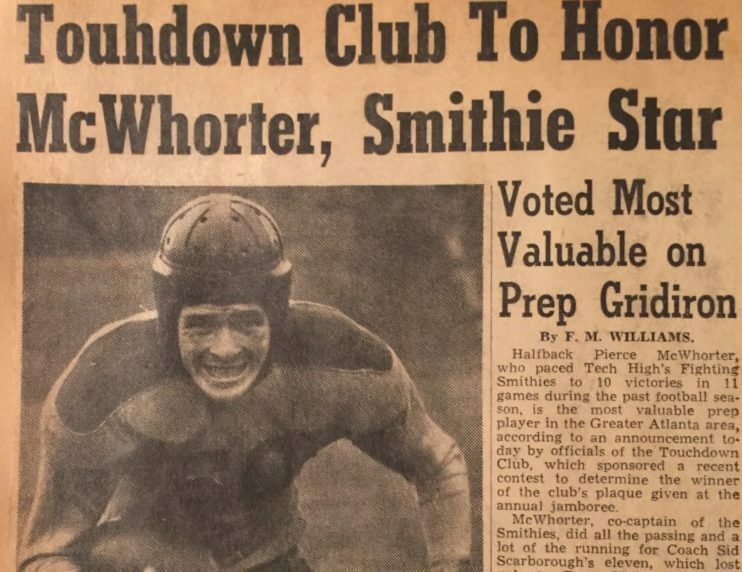 Halfback Pierce McWhorter – TCA Player of the Year in 1945 from Tech High in Atlanta. “Fierce Pierce” as his classmates called him, helped lead the Tech High Smithies to a 10-1 season. The 185 pound junior Halfback did all of the passing and most of the running for the Smithies in 1945. McWhorter’s Smithies would play Macon’s Lanier Poets in what was called, “The greatest shootout ever seen at Ponce de Leon Park”. McWhorter and The Smithies would beat the Poets 26-19 in front of over 20,000 fans. Lanier was led by Georgia Sports Hall of Fame member and Clarke Central’s legendary coach, Billy Henderson. McWhorter would win the Player of the Year trophy from the Touchdown Club of Atlanta by one vote over rival Boys High standout, Porter Payne. Porter Payne was the father of Billy Payne, the man responsible for bringing the Olympics to Atlanta in 1996. Pierce would play pro baseball for the Atlanta Crackers and the Atlanta Braves. He is also the father of Coach Mac, Mac McWhorter, whose near 40 year coaching career spanned the states of Georgia, Texas, and Pennsylvania has cemented him as a coaching legend amongst his former club layers and peers…and also the Touchdown Club of Atlanta’s Key Note Speaker at our annual end of the year banquet in 2016.